He will help you choose between Professional, Enterprise, Enterprise Plus and Ultimate. Compare all four Service Plans side by side, with descriptions, feature summaries and clear pricing. Free A to Z guide on successfully selling hosted Telco and Unified Communication services. Active SoftSwitch is a fully brandable, hosted Unified Communications Software as a Service, with full Class 4 & 5 Telecom features and now with integrated Content Management, Security and more than 100 Apps and Modules. Active SoftSwitch 5.0 now inc. PortaOne MR55. 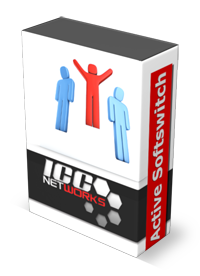 Active SoftSwitch is a world class hosted unified communications service platform developed and supported by ICC Networks in the UK. It is used by Unified Communications Service Providers across the globe. It has PortaOne at the core, providing a powerful, secure and highly resilient service environment and we have developed a stunning Content Management service wrapper containing a wide range of add-on Apps and Services to help you attract and retain Customers. If you are not sure which of our four Service Plans is right for you, "Meet Alex". His illustrated timeline may help you decide. You can check our 30 Day Maximum Commitment Guarantee and our Testimonials then just call us to begin your journey. Active SoftSwitch provides the platform, you provide the creativity and we help you stand out from the crowd. Active SoftSwitch is available in a range of 4 Service Plans, all of which provide a fully featured, carrier grade, fully brandable service from as little as £799 per month. Each Plan has its own features and benefits. Visit our Highlighted Features section for more details on the generic service features which apply to all four plans, our new five star Content Management system, our Telco Grade SoftSwitch and more about the options you have for your Training and Service Support. All of these solutions are available in real time with on-line setup and management, or for truly tailored solutions, use our bespoke web development service (Tailor Made) plus branded support (Intelligent Hands) and fraud protection (STEM-Pro) if required. 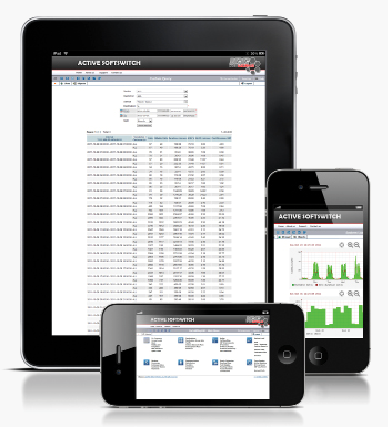 You can pick from a list of more than 100 Apps from your control panel to differentiate your service. Apps include Domain and Security Management, Call Recording, SMS and Email Validation, DDI Provisioning, CLI Authentication, Local Number and Call Forward Management, Facebook, Twitter and Banner Ad Management for your CMS. Our development team is adding new Apps all the time in response to your suggestions and requests. Larger developments can be ordered using our "Tailor Made Software" service for bespoke in-house software developments. Cloud based, full admin access, "...just like having your own switch"
30 Day Maximum Commitment Guarantee. No Long Contract. Great UK based 24/7 support, full Geo Redundancy & BGP Routing.